The first VLBI image of Class-I 44 GHz methanol maser with KaVA! 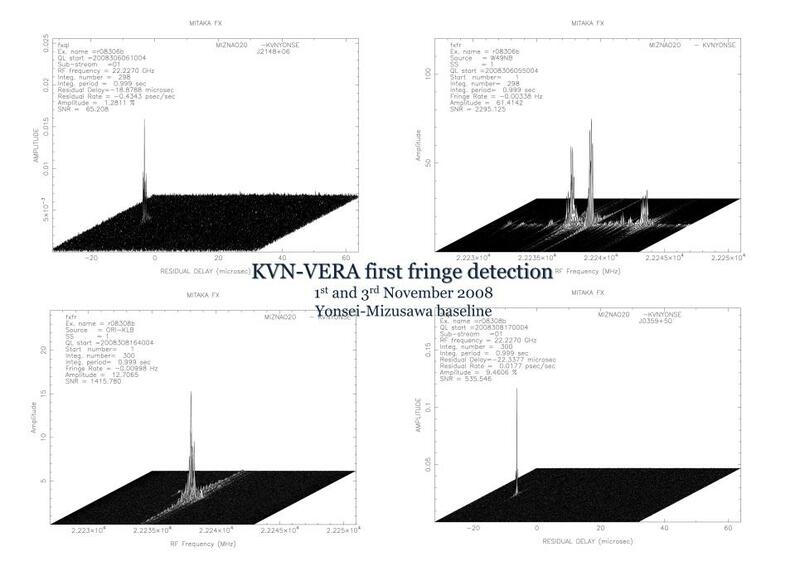 The first test observation has been made between KVN Yonsei station in Seoul and VERA Mizusawa station on 1 November 2008, and fringes have been successfully detected at 22 GHz. 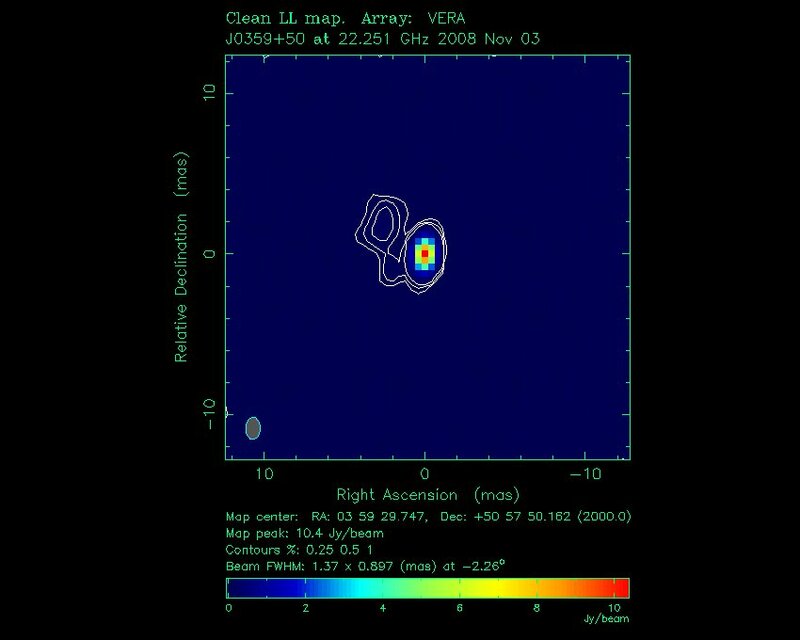 fringe of NRAO150 at 22GHz on 1 Nov. 2008. We have successfully obtained fringes between KVN and VERA full array. On 16 October 2009, the fringe test observation data of 22GHz were recorded on magnetic tape with DIR-1000 recording system, and correlated with FX-correlator at Mitaka. 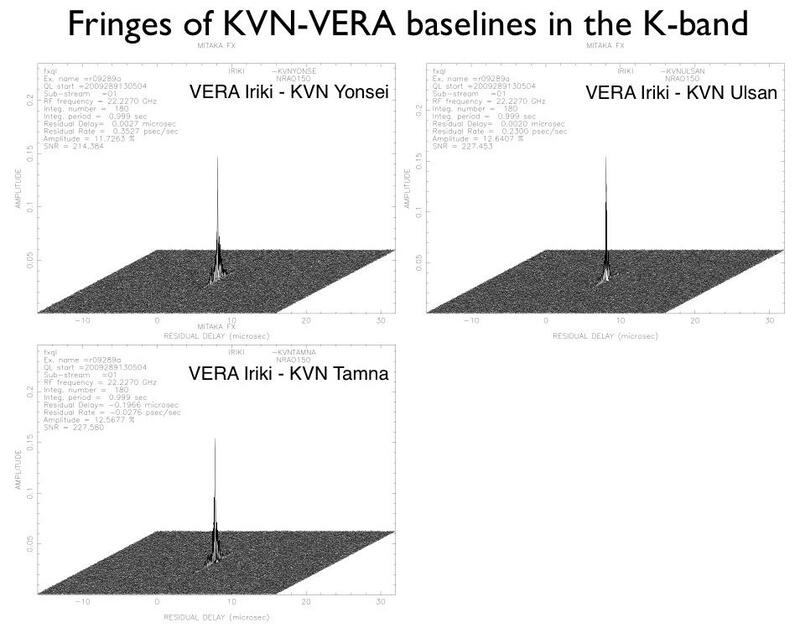 On 27 January 2011, we also have successfully obtained fringes between KVN and VERA full array with Daejeon-correlator at KJCC(Korea-Japan Correlation Center). KVN observation data were recorded on hard disk with Mark5b, and VERA data were recorded on magnetic tape with DIR-2000. These successful fringe detections make it possible to confirm good performance of the sensitivity and imaging capability of KaVA. This is the first KaVA imaging result, and the first case in the world to image the Class-I methanol maser with VLBI technique. 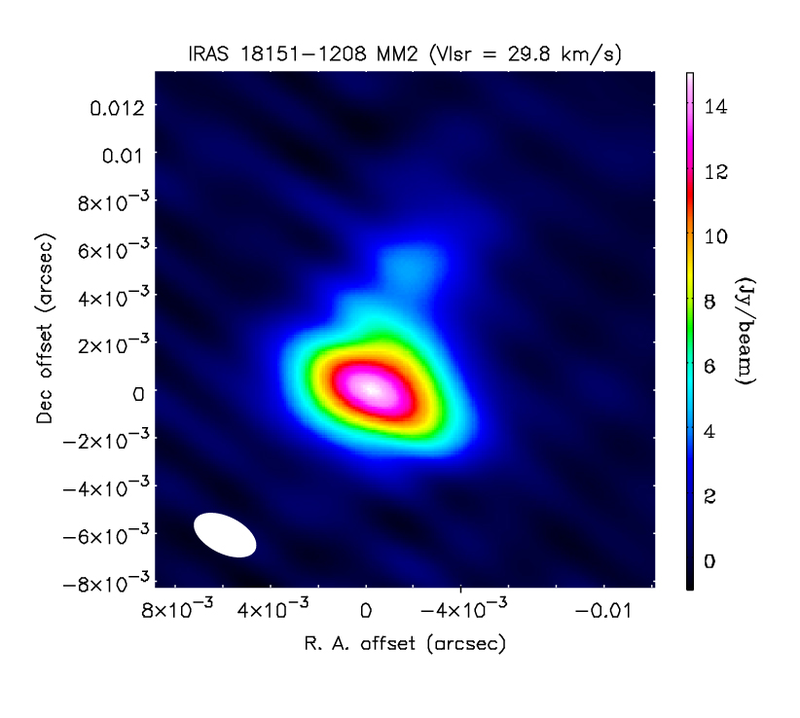 The KaVA team observed Class-I 44 GHz methanol (CH3OH) maser around a massive star-forming region of IRAS 18151−1208 MM2 with KaVA array on 2012 April 8th. 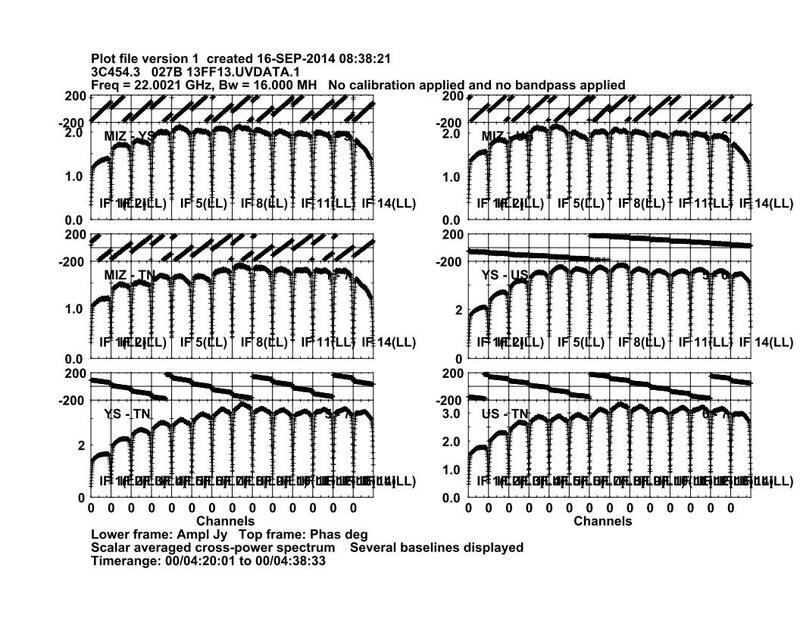 This source is one of the brightest 44 GHz methanol masers, which was newly detected in KVN single-dish surveys. From this result, we found that the Class-I 44 GHz methanol masers have compact components with the size of a few tens of AU. Further observations of the 44 GHz methanol masers would be able to provide three-dimensional velocity maps, and useful informations to reveal the maser pumping mechanisms. Methanol masers are classified to Class I and II from the properties. This is the initial result of extended jet structure of AGNs using new VLBI network “KaVA”, which consists of KVN and VERA. Generally, to obtain a high-quality radio image of an astronomical object, it is necessary to organize as many radio telescopes as possible in VLBI observation. The KaVA team observed three well-known bright AGNs with this new VLBI array. Fig. 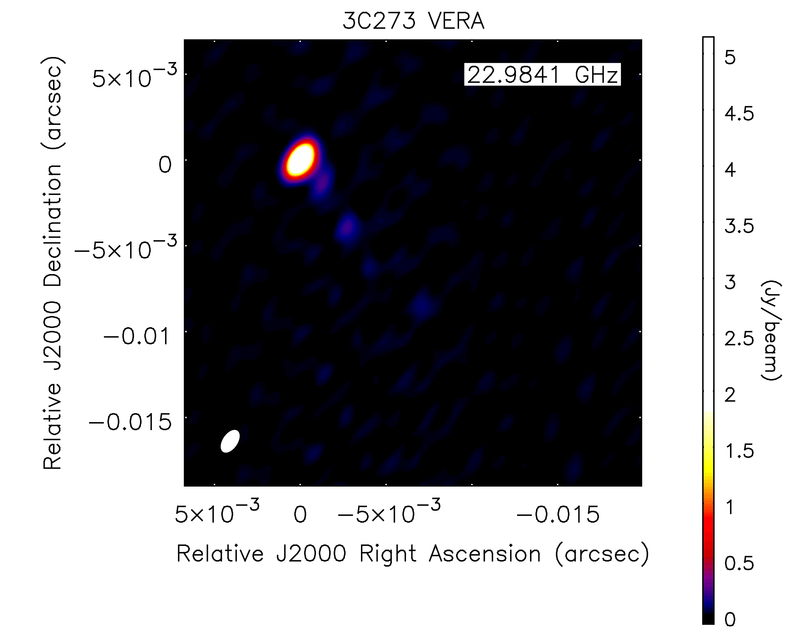 1: Intensity maps of bright AGN 3C 273 observed by VERA (left) and KaVA (right). By this observation, we confirmed that KaVA observation is able to reproduce the complex structures of AGN jet very well (Fig. 1). 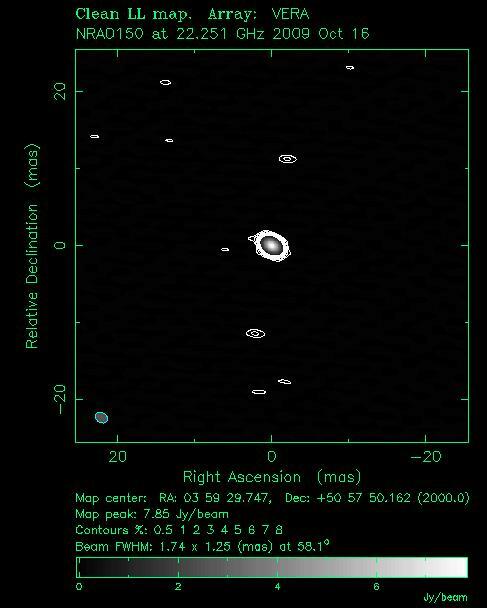 This result shows the very high imaging capability of KaVA compared with that of VLBA#1, which is the one of the most powerful VLBI array in the world. We expect that KaVA is very promising VLBI array to investigate the physical mechanism of the jet formation in AGN.